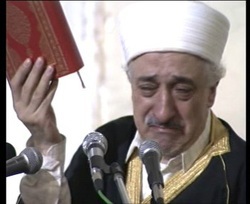 Turkey’s populace—once deemed the most secular and liberal in the Muslim world—is reverting to its Islamic heritage, complete with animosity for the infidel West and dreams of Islam’s glory days of jihad and conquest. And American parents allow their children to travel to Turkey each year for a form of indoctrination of Islam! Where are your minds? 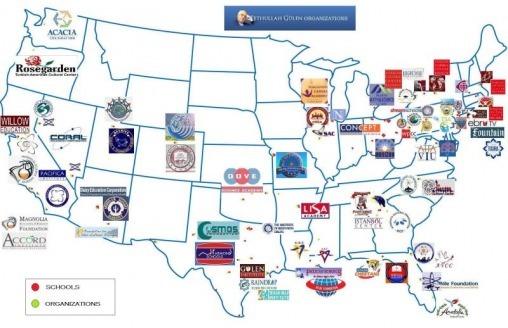 Schools Run By Turkish Terrorist Hiding in U.S.
Gulen Charter Schools In The U.S. 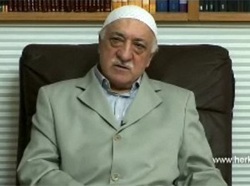 The investigations are centered on whether some charter school employees are kicking back of their salaries to the Gulen movement, which is led by a Turkish exile Fathulah Gulen, an Islamist political figure, who is in cross hairs with Turkish Prime Minister Recept Tayyip Erdogan and has been living in Pennsylvania after being granted asylum by the US. passed up for those imported from Turkey. “The schools are funded with millions of taxpayer dollars. Truebright alone receives more than $3 million from the Philadelphia School District for its 348 pupils. Tansu Cidav, the acting chief executive officer, described it as a regular public school,” reported the Philadelphia Inquirer. Inc. (440) but fewer than a technology powerhouse such as Intel Corp. (1,203),” added the Inquirer article. Gulen runs charter schools in Ohio, California, Florida, Texas, Arizona, Utah and other states. Last year, the Los Angeles Unified School District granted a charter to the Gulen-affiliated Magnolia School in North Hollywood and portion of Birmingham High School in Van Nuys. Recruiting Our Children To Islam In Our Schools! "From the beginning, you and your classmates will become Muslims." Children choose Muslim names, "play Jihad," memorize the Quran, pray to Allah and fast for Ramadan. Islam is transformed to a fanciful fun religion and an unrealistic view of Islam is planted in their minds, even as Christians and Jews are killed at every border of predominantly Muslim nations. U.S. District Judge Phyllis Hamilton ruled these class activities are acceptable, opening doors for all schools to incorporate such approaches. "Students generally do not have a Federal right to be excused from lessons that may be inconsistent with their religious beliefs or practices." Pay attention. There went religious freedom. A brave few parents have been objecting to the Christian persecution and Muslim indoctrination happening in public school today. Darla Dowell bravely objected to the censorship of Christmas in public school while all other religions are allowed. She stood alone. Valerie Moore objected to a large banner in front of her school proclaiming, "There is one God, Allah, and Mohammed is his prophet." Valerie, too, stood alone. Elizabeth Lemmings objected to the activities in "Islam: A Simulation." A teacher and alone, the social pressure was intense to the point that the family involved actually picked up the baton and filed the lawsuit against Byron Union School District on behalf of their children. The case was dismissed. It takes courage to stand up for what is right, to fight for religious freedom. How disappointing that a federal judge completely disregarded the double standard and dismissed the case, leaving children mandated to memorize the Quran, learn Muslim beliefs as fact and embrace Islam. America, God has been warning us, and we did nothing. Public schools are forcing our children to know other gods. Our children's textbooks teach that Rome fell 1) because of Christians somehow... 2) because of the lethargy of the people. History is repeating itself. Instead of getting involved, we went shopping. We cared more about the content of the latest burger at BurgerKing than we did the content of our children's textbooks. We turn off Bill O'Reilly to avoid conflict, we would rather be entertained at the movies. We applaud Frodo and Aragorn in "Lord of the Rings," we cheer as they forge ahead against impossible odds overwhelmed by the enemy, we live and breathe their victories, but we bury our heads at what is happening in our own world. Mel Gibson played a courageous godly man in "The Patriot." At first he refused to get involved with the Revolution, remembering the cruelty of war in the past. But after his son lay murdered in his arms, after evil and oppression overtook his world, he attacked the soldiers who intended to unjustly hang his second son. We cheered as he fought a bloody battle and freed his family. Afterwards, in moments of reflection, his sister-in-law said, "You've done nothing for which you should be ashamed." The Patriot replied, " I've done nothing, and for that I am ashamed." Beloved Americans, we should be ashamed. Too many of us have done nothing. Our children have endured sustained attacks on their faith alone in public school and are floundering. We are losing our families, our heritage, our freedom. Islam is resolved, either by persuasion or force, to overtake America. Clear evidence shows that Clinton surrendered our children to Islam. The courts are following his lead and President Bush...if President Bush has taken any action to clean up our schools from Muslim indoctrination, it is behind the scenes and I pray it is so...but with every day that passes, with every unanswered judgment by a treasonous court, hope for revival led by a godly president fades. So as we close our eyes to the state of our country and buy tickets to see Frodo and Aragorn fight for the freedom of Middle Earth, as we cheer for the courage of the Patriot, as we think we identify with heroism, know that we left the real heroes out in the cold. The Darla Dowells, the Valerie Moores, families who sacrificed their worlds, who risked subjecting their children to persecution, who stood against public school tyranny. But they stood alone, and today, with the stroke of a federal judge, they lost the war they battled to protect OUR children. Will we now rally together, pick up the AMERICAN flag and fight for our freedom? Or will we find the remote, flip the channel and remind our children to go study their Quran. Perhaps we can last another ten years before we notice the CONTENTS of the Quran...and what the judges rule...how far the sun will set before we notice the last vestige of our freedom is gone. Rev. Austin Miles is still standing, fighting alone. He has filed a petition to disbar Michael Newdow, the petitioner against the Pledge phrase, "under God." Miles submitted evidence that Newdow has filed frivolous and malicious lawsuits, violated the rules of professional conduct and lying to the courts under oath. At age 70, Miles is recovering from double strokes. Miles alleges that because of the deliberate, malicious actions of Newdow, he has caused additional health problems, and liability is being established. Indeed Miles is concerned for his life, but the State Bar of California has simply closed the file, apparently closing the file on Miles' life as well. Beloved Americans, protest. Protest now. Because if we don't vigilantly guard our freedom, if we don't stand together as one nation under God, we are set to become one world under Allah, instructed to kill all who disbelieve. Yes, there are peaceful Muslims, yes, we should love Muslims, but their holy book, the Quran, is the foundation of Taliban regimes. 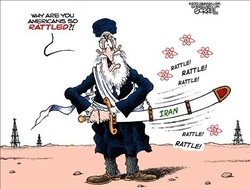 Look at every predominantly Islamic government. And in that event, just show me the line of the martyrs. You can have that world. There is no room for me in Islamamerica. When Americans truly hate Christians and freedom so much they prefer Islamamerica, we will give it to you, but I pray America goes out with more than a whimper. Our forefathers fought for better than that, they paid with blood what we're giving away.